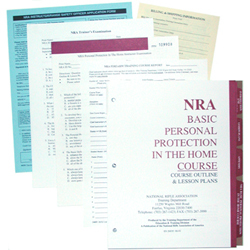 The NRA Personal Protection in the Home (PPITH) course is what is referred to as a discipline course. You must have completed and passed the NRA Basic Instructor Training (BIT) prior to taking a discipline. Upon completion of this discipline the Instructor candidate will be able to conduct and instruct NRA Personal Protection in the Home (PPITH). The NRA Basic Personal Protection in the Home course teaches the basic knowledge, skills, and attitude essential to the safe and efficient use of a handgun for protection of self and family, and to provide information on the law-abiding individual’s right to self-defense.